Back in Zero Cost Trickle Charger we discussed how you could assemble a trickle charger from a discarded plug-pack (‘wall wart’ in the US) and a single resistor. That design could charge at about half an amp – perfect for keeping a car battery topped-up. Now it’s time for its big brother – it will charge at up to 3 amps. Or, with bigger components, up to 12 amps. And again this is a charger you can make for nearly nothing. If you look at the amp ratings of chargers available in shops, you’ll see plenty of cheap car battery chargers. So why would you bother building the DIY design shown here? Second, even a cheap charger will cost a lot more than the one described in this story. All battery chargers need a way of dropping the voltage from the house supply voltage of 240V (or whatever your country’s supply is) to a voltage suitable for feeding into a battery. In addition, the AC supply needs to be turned into DC. 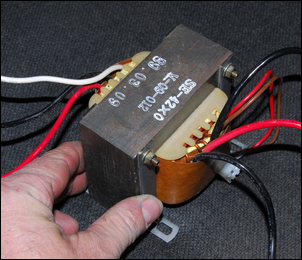 Transformers are passive devices that can alter AC voltages. So connect the high voltage side of a mains-rated transformer to household power and, depending on the design of the transformer, out the other side will come 7, 9, 12 or 15 V – whatever the transformer is designed for. In fact, even that’s not quite the case – a transformer with a secondary rated at (say) 12V AC will have a higher voltage output unless it is loaded to its full current capacity. The greater the difference that occurs between the loaded and unloaded outputs, the worse is what is called the transformer’s 'regulation'. In most applications, a transformer with poor regulation is inferior, but in a very simple battery charger, a transformer with poor regulation actually works rather well. More on this in a moment. OK, so you need a transformer – it’s the heart of the charger. But new transformers capable of more than an amp or so are always expensive. Always. So how can we build a battery charger at near zero cost? There’s a short and simple answer - the availability of discarded transformers. Specifically, those transformers designed to power 12V halogen MR16 bulbs often used in household and commercial lighting. These transformers can now be picked up at garage sales, the tip, through eBay and the like for near zero cost. Like, literally a few dollars each. Important note: the transformers I am referring to typically look like the one pictured here. They are usually rated at 50 watts. Fully electronic designs are much smaller – they look like this. They are unsuitable for this battery charger. They normally have ‘electronic’ marked on them. So the first step is to salvage at least one ex-halogen light transformer. If you keep your eyes open and like visiting junk places, this is surprisingly easy. The transformer produces low voltage Alternating Current (AC); now how do we turn that into Direct Current (DC)? The answer is again easy. All you need is what is called a bridge rectifier. These are available very cheaply new (eg Jaycar Electronics ZR-1324 at $5), or can be salvaged out of lots of electrical goods. They’re easy to spot – they’re one of the few 4-legged devices that you’ll find in the power supply section of a piece of equipment. The bigger they are, the better. That applies even more so if they’ve obviously been designed to bolt to a heatsink. As a safety measure, you’ll also need a fuse. 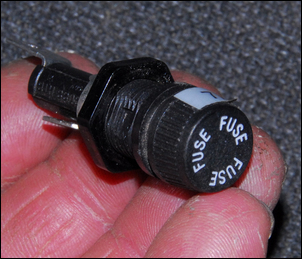 A car fuse and holder are fine, but literally any fuse holder that will hold a 4 or 5 amp fuse can be used. 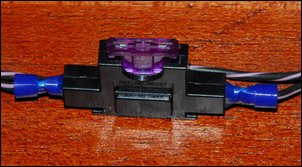 Here’s the sort of fuse holder that you’ll find in many discarded consumer items. Plus a few other salvaged bits and pieces like cable and maybe a wooden base plate on which to mount the parts. 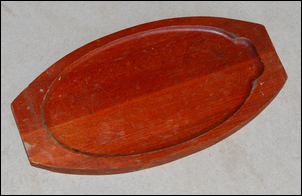 I picked up this wooden plate from the shop at the local tip for $1. Turned upside-down, it made a perfect mounting base. The circuit diagram for the battery charger looks like this. Mains power gets connected to the transformer’s primary windings. 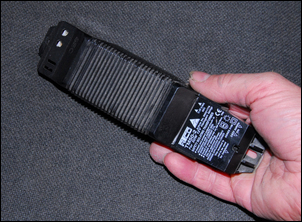 Any 3-pin mains power cord cut from a discarded consumer item can be used. The earth lead should be connected to the transformer’s metal frame (a screw is provided) and the neutral and active leads connected to the primary of the transformer. Normally, this is clearly marked. If it isn’t, or you’re at all unsure of what you’re doing, seek help from an electrician or electronics technician. We’d suggest avoiding putting any switch in this supply – simplest is just to plug it into a power point and switch on at the power point. 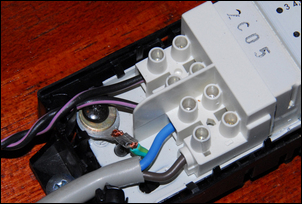 When the cover is closed, the mains connections should be completely isolated from unwary hands. If a proper cover does not exist, the transformer must be placed in an insulated box. Always disconnect the cord from mains power when doing any work at all on the charger. The two ‘~’ connect either way around to the transformer’s secondary (ie low voltage) side, the ‘+” is the positive power output and the ‘-‘ the negative power output. 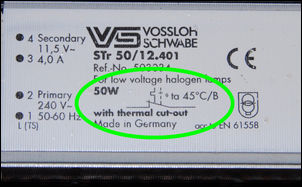 At this current, no heatsink will be needed on most large bridge rectifiers – but after charging for a while, you may want to check it’s not getting too hot to comfortably hold. If it is, add a heatsink. 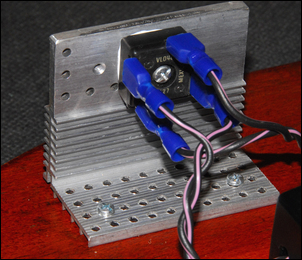 I used a smaller bridge rectifier and so installed a heatsink when the system was first built. 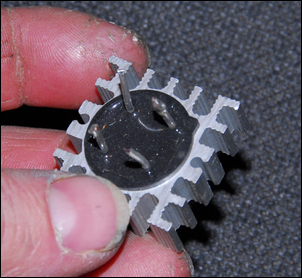 Heatsinks are salvageable from nearly any electronic product that is thrown away. These transformers also have an internal over-temp cut-out that switches off the transformer at around 45 degrees C.
You’ll need some clips to connect the charger to the battery. I happened to have some brand newies around, but if you don’t, they can be salvaged from an old broken battery charger or bought new. 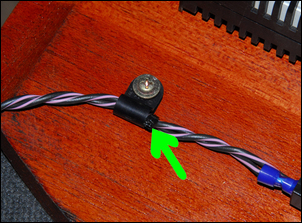 The red clip connects to the positive wire coming from the fuse, and the black clip connects to the negative terminal from the bridge rectifier. Because a battery charger is likely to be moved around a lot, clamp both the output and mains power cables. 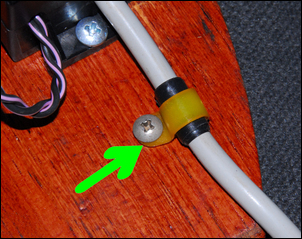 Here the mains power cable clamp can be seen – note that the cable has been increased in diameter to match the available clamp by wrapping the cable in tape. Here’s the battery charger output. A cable tie has been used to prevent the cable from slipping through the clamp. If you connect the charger to an absolutely dead flat battery, it’s possible the fuse may blow – this charger isn’t suitable for that application. That’s because too much current will attempt to flow and the fuse will chop that short. As indicated above, if you connect the output leads together, the fuse will definitely blow. 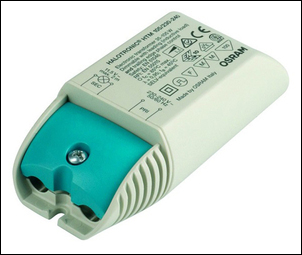 So this is a basic charger – the current limiting is only by the fuse, and there’s no timer or any way of assessing when the battery is fully charged – you simply disconnect it after an appropriate time. On test, this charger outputted a no-load 17V DC and flowed about 3 amps when connected to a battery with a ‘flat’ voltage of 11.6V. 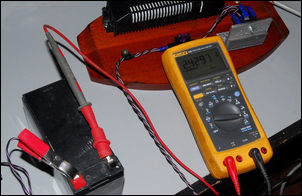 Here it is charging an SLA (sealed lead-acid) battery at 2.4 amps continuous. That makes it ideal for overnight charging of car batteries that are down a bit, or even charging smaller SLA batteries of the sort used in electric bikes and the like. Remember, don’t leave the charger connected permanently – just leave it connected long enough to bring up the battery voltage to a charging 14.4 or so volts. The pictured charger cost me about $5 to make. 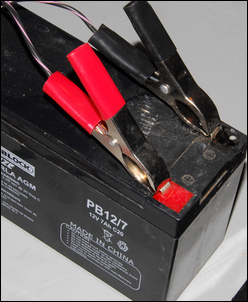 Keep your eyes open and accumulate literally less than a handful of bits and it’s possible to make this effective battery charger for nearly nothing! We also considered lots more sophisticated designs using auto switch-off, series resistors, and multiple transformers. For example, you can use the eLabtronics Voltage Switch to disconnect the charge when the battery voltage rises sufficiently. You can also use a series resistor to limit current, as we did in Zero Cost Trickle Charger. However, each time we increased the complexity, the cost and difficulty of construction also went up. So in the end we kept coming back to the simple design presented above. It works, in its most basic form takes only minutes to make, and can cost nearly nothing. However, if you can find a more powerful transformer, there is one upgrade you can make that necessitates only one more component. 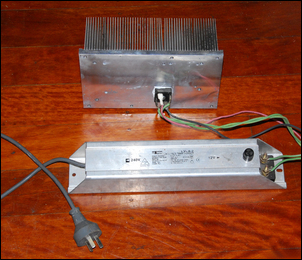 Halogen light transformers are also available in greater than 50W configurations – the one shown here is 200 watts! Team it with a heavy duty bridge rectifier (definitely mounted on a heatsink – that’s the new requirement - although it doesn’t have to be as huge as this one) and the maximum charging current will rise a long way. However, because the nominal voltage output of the transformer is the same, higher charge current will occur only when the battery is flatter to start with (ie the voltage sag won’t be as great so more current will flow), or you charge multiple 12V lead acid batteries in parallel. Rate the fuse to suit the new charging current maximum – eg 15 amps. Note: these higher power transformers are far harder to find, especially as discards.